Friendly, stylish, warm and welcoming Clayton Hotel Manchester airport prides itself in being a home from home for its guests. Within walking distance of the airport but also boasting a free shuttle bus to both the airport and train station, getting to your flight could not be easier. Great value on Manchester Airport parking. Standard, Family, Executive and Accessible rooms are all available featuring ‘dive in to bed’ duvets and big fluffy pillows for a fantastic night’s sleep. The en-suite, recently decorated rooms are soundproofed and all feature tea and coffee facilities, internet access, a work desk and flat panel TV. The Brassier restaurant is popular with locals and travellers and has become a favoured location for romantic dinners and special celebrations. Offering a wide range of well-prepared dishes designed to suite all palates, whatever your particular fancy. Younger diners are equally well catered for with their own menu feature creative balanced options to suit smaller appetites. Breakfast is served daily with a choice of continental or full English, and don’t worry if you are in a rush to catch an early flight grab yourself a ‘breakfast to go’ bag and head straight on out. 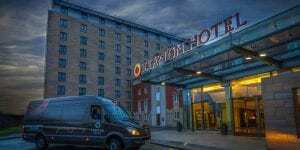 If you are looking for a Manchester Airport hotel or for a Great deal on Manchester Airport hotels with parking included then this is the page for you. For an early start then either the Premier Inn North or South offer fantastic value with a name you can trust and that great breakfast. Both hotels are right alongside Manchester Airport. If the kids would like to let of steam in the pool, get them a little worn out before the excitement! of a nights sleep and holiday flight, then try the Britannia Airport Hotel Manchester. If you want to let off some steam and hit the gym before the holiday break give The Village Hotel Manchester Airport with Park and Fly Deals a look. Perhaps its a country house hotel and some fine dinning at the Mere Court Hotel Manchester Airport that would make the perfect start. 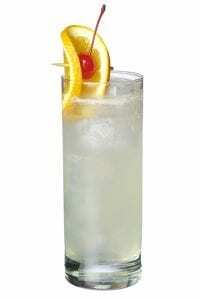 What the Tom Collins are you waiting for? You’ve made it. Work is done, luggage packed, travelling companions are by your side and a cold refreshing cocktail is in your hand. You have just arrived at your Manchester Airport Hotel, parked the car, checked into your room for the night and found the bar. In front of you that long awaited holiday and maybe another cocktail or two. One of the great things about a Manchester Airport Park and Fly deal is the chance to unwind before you fly. And what better place to do that the The Radisson Blu hotel at Manchester Airport. Short of sleeping on the runway you would struggle to be closer to the airport. The Radisson Blu is just a short walk through a covered tunnel from check in. It is also rather swish and has a rather wonderful cocktail bar in the shape of Little M.
Treat yourself, you are worth it! How do you make a Tom Collins? Simply add a squeeze of lemon juice and sugar syrup to the gin, top with ice and chilled soda water. Garnish with a slice of lemon. Sit back sip and enjoy. How do you make sure you start your holiday with a Tom Collins in your hand? book the The Radisson Blu Manchester Airport and get yourself along to its wonderful Little M cocktail bar.